Power your Blackmagic Design Pocket Cinema Camera 4K from a D-Tap source with this Core SWX Powerbase EDGE Battery and D-Tap Cable Kit put together by B&H. The kit includes the Powerbase EDGE V-mount battery, an LP-E6 dummy battery power cable, a D-Tap wall charger, and a coiled D-Tap to 2-pin cable. To power the Pocket 4K via D-Tap, connect the coiled D-Tap cable to the D-Tap-output on the EDGE battery and the 2-pin power connector into the camera power port. You can also use the included LP-E6 dummy battery with 8.4 VDC barrel output to power your camera. The included wall charger is used to charge the battery. Read more below about the items included in this kit. 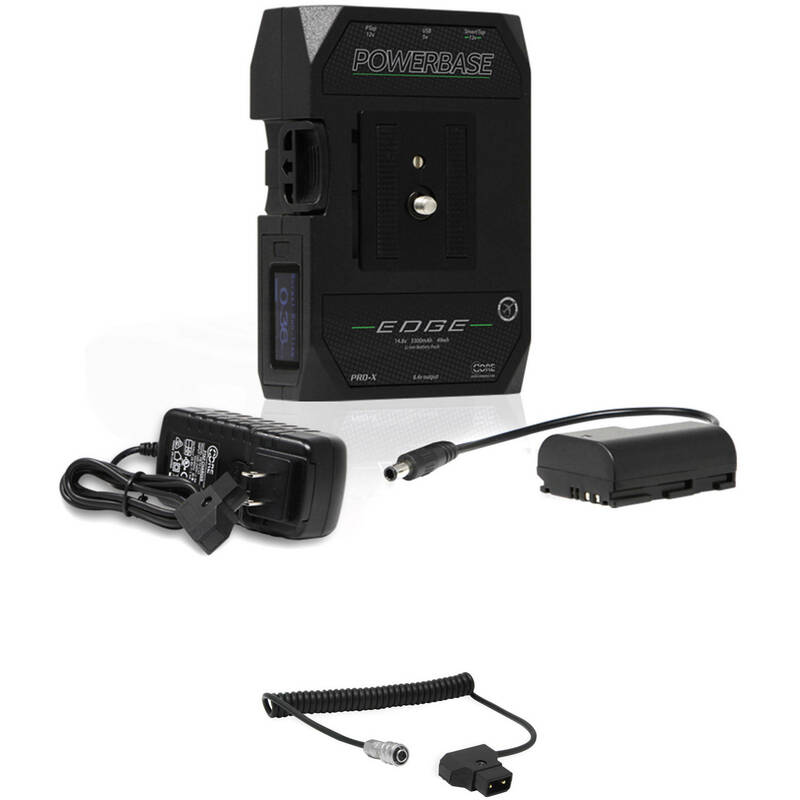 This Core SWX Powerbase EDGE Bundle includes the Powerbase EDGE V-mount battery, an LP-E6 dummy battery power cable for the Blackmagic Design Pocket Cinema Camera, and a D-Tap wall charger. Connect the DC coupler cable into the 8.4 VDC barrel output on the battery to power your camera. To charge the battery, use the included wall charger. The Coiled D-Tap to 2-Pin Cable for Blackmagic Pocket 4K from Core SWX allows you to power the Pocket 4K camera from a D-Tap power source for longer runtimes. The cable extends from 18 to 48" in total length, providing the flexibility to use it on different parts of your camera rig. Box Dimensions (LxWxH) 5.1 x 3.45 x 0.85"
Powerbase EDGE Battery and D-Tap Cable Kit for Blackmagic Pocket Camera 4K is rated 4.4 out of 5 by 17. Rated 5 out of 5 by lane from Works Perfectly. First - this battery does NOT lose power when not in use as previous reviewer stated. You need to long-press the “power” button (about 20 seconds) then it goes into storage mode. This is a nice solution for the pocket 4k. I like the form factor better than anticipated. I leave it on the cam all the time. Definitely recommend. Accurate time remaining display, lasts about 3hrs of recording, swaps out in 15 seconds. Feels like a nice extension to the cam. Pricier than other solutions, but if you have the budget, I haven’t found a better solution. Rated 5 out of 5 by Tolu from Go for it! So, if you are reading this review, you most likely know about the disappointing battery performance that plagues the bmpcc4k. I initially purchased extra LPE6 batteries, as a solution, but quickly became annoyed with having to swap out the batteries frequently-- and keeping up with charging all 8 of them. Finally decided to give the CORE SWX a try and my only regret is that I didnt go with this solution earlier. I get about 3hrs of battery time per charge and the added weight of the battery helps balance out the camera for hand-held filming. Yet somehow, the entire unit remains low-profile; which is a definite plus. This is definitely a must-have if you own a pocket 4k. Rated 5 out of 5 by Hector from Its a battery, a good one If you want almost 4hrs of runtime with this camera from a single battery, on a single charge, you should get it. You can fumble around with a bunch of canon batteries, but its challenging to keep tabs on which lasts longest(only 40minutes at best), and even more difficult to keep recharging all the canon packs after a shoot. Pros need quality solutions which makes production easier and more efficient, and this does that, so Id recommend. Rated 3 out of 5 by Brent from Just okay. So I have 4 Anton Bauer Cine batteries and I decided to give these a try for my new Pocket 4K. They're just okay. They lose their charge FAST when not in use. After just a day they'll be down 5-10%, where my AB's are still at 100% several days after being charged. In less than a week of no use, from fully charged, these are down to 50%. Can't recommend. Rated 5 out of 5 by Glen from Indispensable for Black Magic Pocket 4K Researched all battery options for my pocket 4k and this one seemed the most sensible. No regrets on my purchase. Battery is smaller and lighter than the picture lead me to believe. As advertised, you get around 3 1/2 hours with it. Picking up another one or two which should give me enough power for an all day shoot. Great solution to the Pocket 4Ks Achilles heel. Rated 5 out of 5 by Derek from Super storage and Super light It can last about 10 hours on my a7sii!!! And many hours on the Fs5 as well as the Atomos Shogun. I bought a second one as well I like them so much. The weight is so light. The fact that they have three power ports is super versatile. And I actually love that it just comes with a wall charger and I don't have to spend money on buying a charger. It only takes about 2.5 hours to charge to full, not bad at all. And it doubles as a v-mount for my portable lights if I ever need. So good!!! Rated 5 out of 5 by Devon from Works as intended with BMPCC4K I have not yet used the dummy battery, but Ive used the battery with the BMPCC4K with the Wooden Camera cable. Works well.